A few days ago after our last weekend's ride, Skyline35/Charlie brought up this Everything Skeggs (aka All of Skeggs) ride, conceived by Biking Brazilian. I tried, but couldn't get the idea out of my mind even though that meant I had to say to Erik that I would not go diving with him and his friend, a plan they made a while back. However, when I tried to recruit riding partners, the friends I asked all gave legit reasons not to do this ride, or not to do this ride with me on this day. (And ratpick/Patrick beat me to it by three days.) Fine, I'll with just ride with me and myself then! Do not have major mechanical issues. Flats are always a time sink. I did have one moment of scare though. That was when I was flying down ECdM trail with only about three miles to go near the end of the ride. I turned around a corner and suddenly saw a rider coming up. I braked hard and the almost bare rear tire skidded a little. Then I wanted to pull over to the side to let him by. That was when I still had a little speed and a root that stuck out of the wall on the side that I didn't notice clipped my handle bar. My bike twitched and started tipping towards the cliff side. I can't count how many times I had tipped over because I couldn't clip out, but luckily this was not one of them. I managed to got my feet on the ground before the bike went over the cliff. Whew! I immediately did a head check — I had been riding very conservatively the whole ride and I would not screw up in the end! I could feel my thighs threatening to seize up from time and time and I was always able to back off just in time to prevent it from cramping up. I made sure to keep drinking my sports drinks and ate quite a bit during my breaks. I did not get that noodly legs feeling throughout the ride. Whoohoo! As you can see, I broke the route into a few fairly simple segments. Every time I just needed to remember the segment I was doing. It worked pretty well for me because otherwise my stop time would have been more, but instead my over all time was less than seven hours. I was amazed how well thought out this route was. It tackles the most difficult climb (Lower Fir) and the most challenging trail (S. Leaf) in the early stage of the ride. The more into the ride, assuming the more tired you are, the less technical the riding gets. Not only that, it covers all the most popular trails such as Manzanita, Steam Donkey, Blue Blossom, Resolution, and Giant Salamander in their "correct" direction. The only modification I made was I did the out and back on Spring Board Trail right after Blue Blossom before exiting CM06 so that I knew once I took a break at CM06, what was left for me (about 16 miles) would be mostly just fun downhills and easy uphills. I ran into two friends with their respective groups on the ride. At two occasions, different riders (spartan23 and Neela from MTBR) recognized me from the MTBR posts and we had nice chats. Neela made a comment that he saw my ride last week (in this MTBR thread) that was just ridiculous. I made a mental note not to say anything about the ride I was doing. Another thing that made me happy was I was able to give directions to a few people on the ride off the top of my head. Glad to put my knowledge about Skeggs to use! It was embarrassing though when I kept running into the same groups a few times because I was doing a lot of out and backs (in the south east quarter). They must have thought I was weird. For the last third of the ride, I had the GPS on map mode. I didn't want to know the time because I didn't want to worry about it. Figured I would just ride based on how I felt. I cheered out loud when I got back to the car and saw that my ride took less than seven hours. That was a whole hour shorter than I had expected. Yeee ha! Now, this ride had officially made my Skeggs Ride Collection. For details of the ride (directions and map), please see that page. A year+ later, I uploaded the ride to Strava. • October 2, 2010 Mudworm's solo ride: "A Mudworm's Thoughts » All of Skeggs — Skeggs Everything — MTB Ride" Blog post and Strava post . And I have the course record! * July 21, 2012 Patrick, Roy, mudworm again re-lived the glory (for a silly Strava footie challenge). MTBR Thread (#106 and up), Patrick's strava, Roy's strava, mudworm's incomplete track on strava. Knocked it off in 7.5 hours total. A good pace for a group ride. * July 27, 2012 mudworm served as guide for Mr. Mud's Hall of Fame Induction ride. Mr. Mud's strava, mudworm's strava, Garmin Connect, and Mtbguru . * June 19, 2013 Skyline35's 2013 Solstice Ride. mtbr, strava. * Sept 4, 2013 Michael Chapiro (michael1): MTBR Thread. At age 19 (probably half the average age of the rest of finishers), he is the youngest finisher of this route! Note: This list is no longer recording more recent finishers. Sorry about that. • Original map and route directions from Biking Viking's route design. • Skyline35's rendition on mtbguru. Skyline35's map markup. • GPS tracks: Abundant. See the above link, but for the very latest edition (best optimized), please see my Skeggs Rides page. 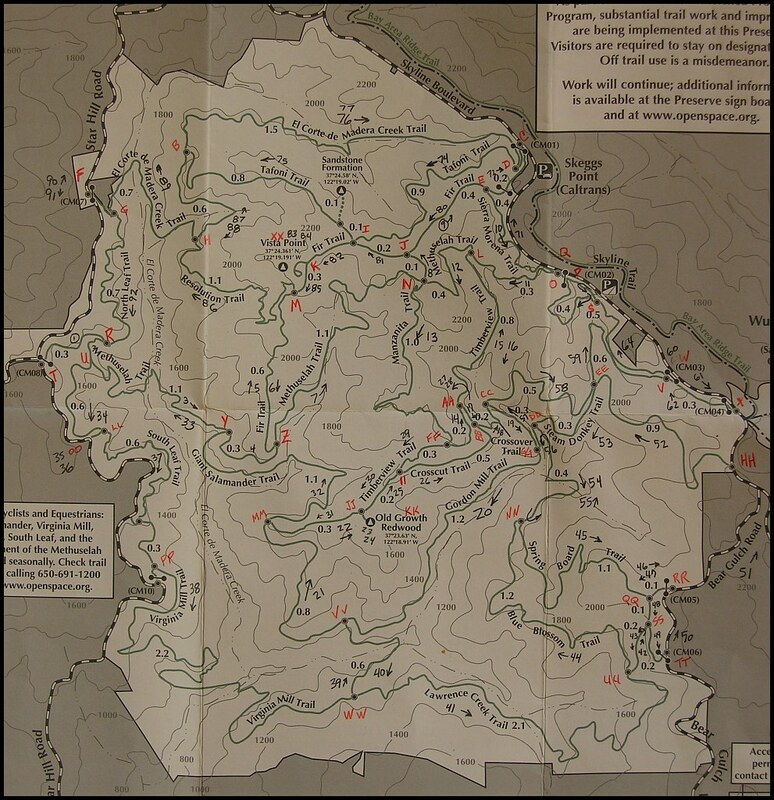 The latest route that incorporates all the recent new trails and closures at Skeggs was published on 7/19/2014. Please see above section for ride links (for GPX). Nice work! Maybe I'll try that someday. PS – Looks like the link to the Skeggs ride page is broken. Hi Krishna, it's a really fun ride. You'll knock it off much faster! The link was bad and it's fixed now. Thanks for letting me know. Congrats Mei.. I completely agree that the route was really well thought out! In a way, I think doing this ride solo is almost better. Which is not to say that I wouldn't have waited until today to join you if I could have, but it's quite a personal accomplishment. I enjoyed riding solo too because I could ride at my own pace, although having company would have been fun and I wouldn't have needed to be too concerned about getting injured out there all by myself. Everything has its flip side. Didn't set out to break your over all time, so it was a pleasant surprise that I did, albeit only by 13 minutes. I was trying to figure out your Springboard change – you mean the lower part of Springboard, right? That's a great decision.. makes much more sense than doing it after Steam Donkey. Headed to ratings now.. already did some of the other routes. Patrick, I think you are still lost in Skeggs. There is no ZZ. BB does not connect with WW. Or… do I need a Chinese translation to understand what you said? Tee hee.. not being specific.. just saying that I was following the original directions which meant decoding and following the letter intersection markers. It took me a while each time I stopped to figure out and then memorize where I had to go next. Your map looks way better! Mei- nice work and now I'm inspired. I love Skeggs and can never get enough. I'll be putting your map to good use. Marc, bag the ride before the little one comes! Oh, Krishna and Marc, if you get out and ride it, can you please vote your ratings too? While at it, see if you know the other rides well enough to vote. I've asked Patrick to vote on this ride too. I'd like to get consensus on the ratings. Very impressed to see how you knocked this off, and at a great pace! 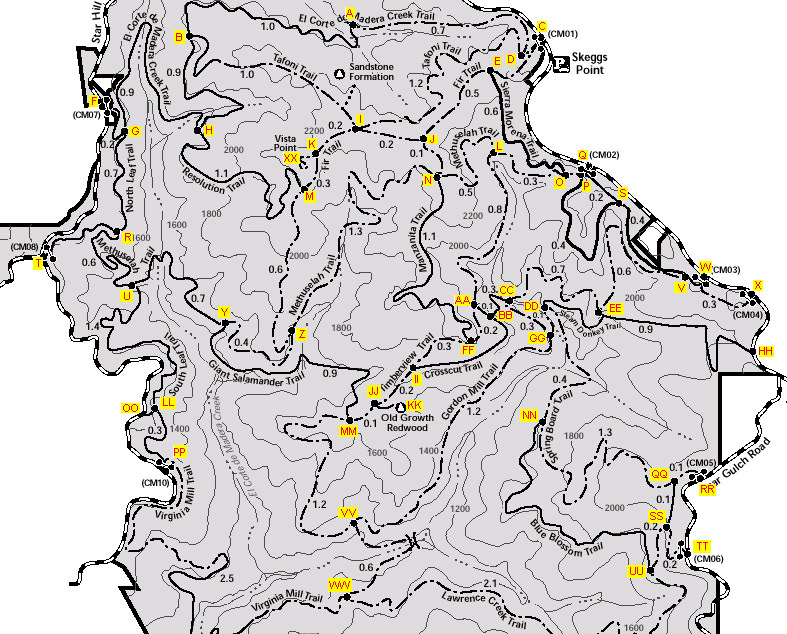 Looking at that GPS track is a bit of a Rorschach test for mtb geeks, but I think it's a work of art. Hey Dirk, there is gorgeous view at one spot on this ride — at the Vista Point off of Fir. Yes, the rest of the ride… you are under the trees. I hope to ride Hole in the Ground some day soon. Love those photos of yours. Wow, what a fun beat-down! Skeggs will always be a favorite for me and this was an opportunity to gorge myself on the goods. I muffed up a bit and did it a bit out of order but still got everything including a little tiny (.05?) connector that I can't find on the map now. Hi SparkyJay, Sorry for the delayed reply (for the same reason below). Yes, congratulations for having completed this significant ride and even did some extra! I'm sorry to have read that you had to miss out the Rose to Toads ride this year due to sickness. Hope you have recovered and are enjoying the trails again! I was thinking about trying the all of Skeggs route sometime this summer, and I wanted to know the age of the youngest person to complete this route. I'm only eighteen, and I thought it would be neat if I could become the youngest person to complete this ride. Another thing though is I'm not sure if I'll be in good enough shape by the end of the summer. How much do you think I can increase the number miles and feet of elevation that I can do in one day at Skeggs after six weeks of training? I did the CCW perimeter loop and it was moderately tiring for me, but I think I could do as much as the half of Skeggs training ride. I recently road biked to the ocean and back from Palo Alto 72 miles with 7000 ft elevation gain. Do you think that I would realistically be able to do all of Skeggs in six weeks time, and how would you suggest I train other than mountain biking? Hi Michael, I am very sorry for the late reply! When someone (ID'ed by the email address) first time posts a comment, it needs to be approved first. I was counting on the email notifications and did not know it stopped working as early as in July! Only just saw a few "old" comments waiting in the approval queue. As for training… really, just go out and do long rides. But if you are time crunched, my hubby recently had an epiphany — hill repeats on a road bike seem to get one strong as well as into endurance shape. It worked well for him, so maybe that's something you can try? Best of luck. And please please keep me posted once you completed the ride so we can share your joy! Thank you mudworm! When I first read your report of this ride, it immediately went on my bucket list. Today, I finally checked it off! I found your post and Strava map really helpful in planning it. I just could not make heads or tails of the directions with the lettering, so I followed your route, and marked it in colorful highlighter pens on my paper map. I noticed that you had popped out onto Star Hill at one point on your ride, and back to CM-08, but I didn't follow that part, so I think that's why my ride had a little less mileage than yours (I hope I didn't miss anything!). When I started out, it was actually 50F and raining! The first climb up lower Fir at the first 2 miles in is quite brutal, especially when you are not warmed up. But ok, it would have been worse at the end of the ride! Sierra Morena had transformed into a little stream bed, so I had a nice layer of caked mud along for the ride for the rest of the day. Saw your strava post on my way home from a climbing trip, and just got on the computer. Congratulations, shredchic! It must have felt good checking off a bucket list item! You wondered about anything missing… the section that popped out is an out and back on ECdM between Tafoni and Resolution. It's a track hard to follow (just ask sparkyJay), so great job getting almost all of it on the first try! Ah, thanks Mei – not sure how you spotted that so quickly! But now I see what I did. I saw the Tafoni sign and immediately just started climbing up it rather than consulting the map, and realizing that I was meant to do an out & back to get that one section between Reso & Tafoni! Funny thing was, I stopped at the intersection of Resolution and ECDM after coming down Resolution and was thinking, "Did I do that one yet? ", but I was chatting with someone there who was asking if I was doing the full Skeggs, and got distracted! Eek. Well, now that I've got this route dialed, this will have to be revisited. Maybe there will be a couple takers for a group ride? That would be fun. Haha… Blame it on Strava. The line indicating an untouched trail on the left hand side of the map really jumped out among all those red lines. Or maybe I just know this route too well. If there is a group Skeggs Everything ride, I'll try to make it although these days our priority is my nephew. Will see.